Random Panel: THAT's the sound of destruction?! Wow. 3 Responses to Random Panel: THAT's the sound of destruction?! Wow. That’s right, Jeff. From the Greek, Bwahahahadeus. “Bwahadeus” was an athelete in the first Olympic games who was known for throwing tantrams and causing a lot of ruckus. You might be more familiar with his Roman name, Hehehevious. So I think you should start changing those onomontoPOWias so they all say Ha ha ha! Earthquakes? Ha ha ha! Explosions? Ha ha ha! Kicked in the crotch? I suppose that’s some form of destruction…Ha ha ha! 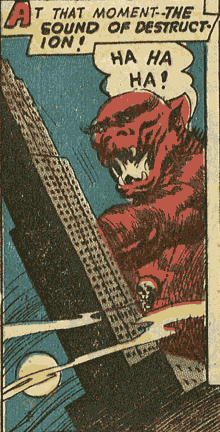 Either this monster’s got a weird cyber jackhammer for an arm or he’s hittin’ the skyscraper with a nub.